Thanks for all your good advice. I know it's lame, but I'm still wishing for something really attractive (and without separate speakers that have to be put someplace, because I have no place to put them) that is all in one unit, like the "suitcase" Crosley. I don't care too much about bass and treble and sound quality, because I'm not going to be spending loads of time listening to records... and the music I love sounds better when it sounds old. Weird, I know. For my high-quality modern music I just use CDs, for which I have a crankin' system. The record thing is more a travel-back-in-time adventure for me. Skips and crackles and bad bass is pretty much exactly what I want. Exciting news... I fitted the crank and put in a new needle and played my Viva-Tonal for the first time today! "Hang Out the Stars in Indiana" by Al Bowlly - it was MAGICAL!!! I'm so thrilled, I'm going to do it again and film it and post it on YouTube because I want my mom (who gave me the machine) and everyone to hear it. WOW! The funniest part was, I had the cabinet closed and it sounded pretty good. Then I remembered that the front door opened, and ... whammo - it was really loud!! Made me laugh. I totally forgot you could open it up! Well, I'm off to DISC-over more stuff about turntables! Have a great day! Ah--welcome to what it's all about! "Magical" is a good word for that amazing 78 RPM sound, and, not to seem obstinate, that's why I'm so reluctant just to say "go ahead and get a Crosley"--a "style is everything, all the works are as cheap as can be" player like that simply can't give you the magic! I'll do a bit of prowling around and see if I can come up with something else. I had a look at my reference book on Columbia machines (Robert W. Baumbach: "Columbia Phonograph Companion Volume II: The Columbia Disc Graphophone and the Grafonola," and it indicates that, assuming yours is identical to the one photographed, your machine is a model no. 611, introduced in 1926 for $115. That would make it one of the first generation of machines designed to play the then-new electrical recordings. According to the book, it should have a walnut case and be fitted with a 12-inch turntable, two-spring motor, nickel-plated hardware (save for the crank and escutcheon, which were gunmetal finish), and a Viva-Tonal No. 15 reproducer. Those two slots under the grille cloth were for a pair of included 12" record storage albums. The model no. 601, introduced simultaneously, was a simpler implementation of the same machine, lacking the flower decoration on the door and the albums (sold separately) and being in a slightly less ornate mahogany case instead of walnut. That one listed for $90. By the by, Viva Tonal machines, for whatever reason, don't seem to turn up as often as their Victor Orthophonic counterparts. Congrats on a lovely and slightly unusual machine! 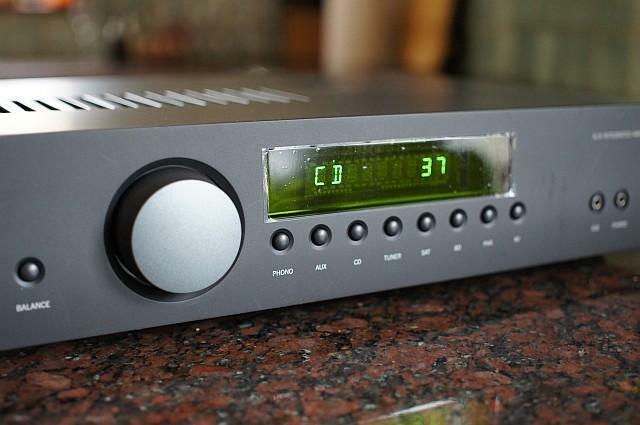 Last week I heard the Naim Supernait2. The amplifier is obviously in a different price range and in a different league. I quite liked the way it gripped the SF Olympica standmount speakers and the bass / midbass / vocals were flowing out ot it very smoothly. I mentally compared it to my 50W Naim Nait 5i and I noticed the SN2 was fleshing it out much better especially at 9 o'clock position for music like Zubin Mehta or Jazz etc..
My speakers are the Merlin TSM - sealed speaker and I was wondering of the extra 30W would make a good difference to the Morel midbass driver on the Merlin vis a vis if I had a ported speaker? The other amplifiers that come to mind are the Exposure 3010s2 and the Rega Elicit R but I do have to consider that I have a Naim CD5XS cd player and Naim speaker cables as well. I get the feeling that the Merlin TSM needs some more watts - solid state and I am not ready for tube amps yet. Your latest Linux article has finally inspired me enough to get off my backside! I'm currently using Win Server 2012 with Audiophile Optimiser/JPlay and it will be interesting to compare this against a Linux 3.0 system. The markets are open here in a couple of hours, will try and find a cheap old desktop computer to mess around. Good on you Andrew. We aim to inspire at TNT-Audio! Good luck with your hunt for a bargain computer. Thanks so much for your advice - I'll be on the lookout for what you mentioned. Thing is, I've got my gorgeous Columbia Viva-Tonal long cabinet in my livingroom, and was hoping for a tabletop turntable in an attractive case (like the Crosleys) to sit on top of it, so that I could play whichever disc struck my fancy. I liked the one I showed you the photo of, because you can close it up and set it down on the floor when it's not in use. I don't think an institutional elementary school box type will make me happy aesthetically, so I may just have to look into finding the proper needles for the Crosley. I'm hedging my bets with thoughts of those Dual 12xx series that you mentioned, in case they are prettier to look at. I live in a tiny cottage built in 1925 with NO storage space whatsoever, so it's not like I can just buy an ugly one and keep it in the garage - ha! My truck and I really wish I HAD a garage... but that's another kettle of fish. Looking forward to your new article... do let me know when it's up! OK, now I have a better idea of your circumstances, and I agree that a Calfone would NOT be an attractive addition to a lovely Viva-Tonal cabinet. Trouble is, the Crosley really is all about looks and not at all about performance or durability. I'm not sure that a Dual will work for you, either; it's just a turntable, and I gather you need something that also has speakers and an amp. Under those circumstances, I'd consider one of the old KLH compact stereo systems from the '60s, like the one that served my family for most of my childhood. You can see one pictured in this expired auction listing. The KLH compacts were Henry Kloss designs, and as such had very clean electronics and his famous vernier-dial-tuning FM, and sometimes AM, tuners. They included decent, sturdy Garrard changers (for which short manual spindles were available) with 78 speed fitted with Pickering cartridges, for which 78 styli are readily available. The cabinets were real oiled walnut, as were those of the speakers, also Kloss designs, which sounded far better than anything you'll find in a Crossley. They were issued in various models, some with larger and some with smaller speakers; I'd shop around on Craigslist and the like until one comes along that fits your space, and I wouldn't spend too much, as these are not great, hotly-sought rarities. The cautions to bear in mind: KLH speakers were fitted with doped cloth surrounds, so they are immune to foam rot, but the woofers were usually non-standard sizes. Make sure they are fully functional. The tweeters, on the other hand, were pretty much standard across most KLH models, and chasing out replacements is not too hard if necessary. That said, I'd prefer to get units that are working to begin with. As to the base units, make sure everything works and that a mono switch is included (I think they were on all the models, but I'm not sure). I read your review of Fidelizer with some curiosity, as I started using Fidelizer with version 4 and unlike the forum chatter preferred it over version 5. Now I've downloaded version 6.5 and find that yes it does increase detail, compared to version 4. However, I also find that this increased detail makes the sound a bit HF heavy, and I lose the richness that I had in the range from upper bass to the mids. I wonder how you found it treated the texture, richness, and balance of this range, such as an upright bass, low strings on a guitar, and piano bass notes? The version that I reviewed was 6.3, and I can't say that I noticed what you are describing. With so many factors involved with our individual hi-fi systems, it is hard to explain why you are noticing that effect with the extra HF detail. Of course it's extremely difficult to understand why something like Fidelizer makes the sort of big changes that it does. Like you, I read various forums, and I saw people saying that they preferred one version of Fidelizer, or the CAD scripts over another, while others preferred a different version. I think that must be down to how the whole hi-fi system sounds rather than one part of it like Fidelizer. I'm sorry that I can't be of more help but you are probably better off speaking to WindowsX. Thanks for taking the time to reply to my questions even when the holidays are still in full swing - I really appreciate it! So... now that we've established what NOT to play my Glenn Miller records on... I need to know what they should be played on. Is there some vintage turntable I need to seek out (perhaps a hand crank table top player with a lighter tone arm? ), or will they play on any modern turntable that plays 78rpm disks? I don't have the cash to splash out on a super expensive turntable, but some of those vintage-styled Crosley turntables are tempting me at the moment. What do you use/suggest? Can you bear to wait a little while? I've been toying with the beginnings of another "Overgrown Pathe" article, this to be on how to choose a 78 RPM turntable. It's still in the embryonic stages, but your question could be just the prod to get me moving. Briefly, if you can't: 78s would be about the only records I'd consider playing on one of those nostalgia phonos like the Crosley, but I think that for the money you could do much, much better in a "78s only" player. For a start, I don't imagine the Crosley would come with a 78 stylus, so right off the top you'd be putting even more money into it, assuming one is available, and my understanding is that these things are not robustly built. If you want a 78s-only player that *is* stoutly built, albeit not pretty, see if you can't track down a 78 capable Calfone. Those are the all-in-one boxes that equipped just about every elementary school in the US at one time, and while I wouldn't trust an LP to one of those, either, a fair number of collectors rely on them for minimum-level 78 playing. For something that will handle 78s (and LPs) at a higher level, you might look for one of the Dual 12xx series stereo automatic turntables (1209, 1218, 1229, etc.) from the '70s. Those, too, are workhorses; be aware, however, that if you buy one it will probably need cleaning and lubricating before it will work properly, so don't pay too much unless it's already serviced. There's much more to be said, but that's at least a start. I hope it helps! I use the SqueezeBox Touch with the Logictech media server. Would you expect the same kind of improvement on this type of system? Fidelizer apparently works when using two computers to play back music, so in theory should make a difference with your Logitech Media Server. But I am sure that WindowsX can give you more information on that. Thanks so much for your help! One more question, if you don't mind: I've read online that you're not supposed to play records made after 1935 on the victrola/gramophone. However, I have several Glenn Miller/Bing Crosby records that are marked "Victor Victrola"... the music is 1940's but as far as I can tell, these records were made to be played on a hand-cranked Victrola. Which confuses me. Obviously, I don't want to ruin my disks by playing them on my Columbia Viva-Tonal long cabinet gramophone, but since they're marked as Victrola records I'm not sure what they ARE supposed to be played on. If you can shed any light on this, I'd surely appreciate it. 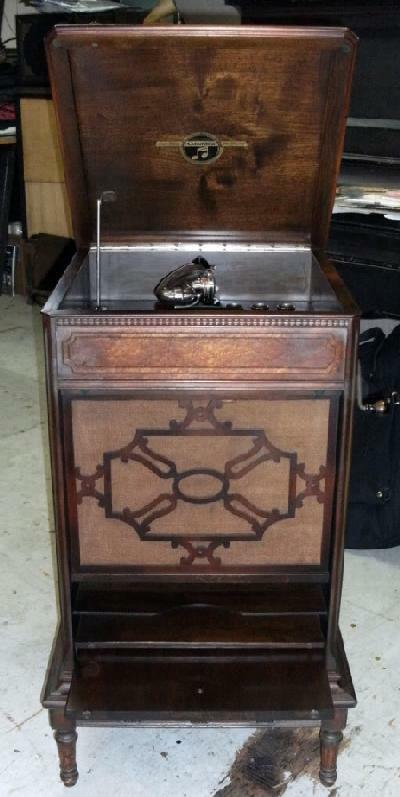 "Victrola" doesn't necessarily equate to "acoustic" or "mechanical" phonograph. Victor kept that name for its record playing instruments long after the stereotypical upright wind-up phonograph was in the dustbin of history. In fact, the "second label" classical issues of the '70s and '80s were issued as "RCA Victrola" LPs, but I can assure you that if you tried playing one of these on a wind-up with steel needles you'd see little curls of vinyl decoratively peeling off the record. (I hasten to add that I know because years ago a cracked 45 of some nonentitiy singing "Michael, Row the Boat Ashore" gave its life for science on my Pathephone. I have been following the mend your acrylic lid with chloroform with interest as I have tried this in the past but a word of caution - at least in the UK - you are not allowed to buy Chloroform at retail outlets - I'm not sure you can buy it in bulk either. Something to do with government restrictions - food safety believe it or not - and the unfortunate film use in kidnappings etc. thanks for the warning! Chloroform is, indeed, harmful if swallowed and irritant to the skin. Exposure through inhalation can cause serious damage to health. One should always wear protective clothing when handling Chloroform and work in a well-ventilated area or under fume extraction. Those working with the material should familiarise themselves with the MSDS (Material Safety Data Sheets) information before commencing work. Reputable Chloroform suppliers provide MSDS with all products. I've discovered that it is quite easy to find here in Italy (15€ 1 liter bottle) while it might be hard to find in different Countries. Hi Andy, my name is Stefano and please excuse me for disturb. I write you for an advise on the Arcam A19. I have read your review, and after read it I have bought the amplifier. Well I found it lacks bass impact. Is it possibile? I use as speakers a pair of Tannoy Revolution dc6t. Reading your review I didn't find a similar issue. Can you give me some help for solve the problem? I certainly didn't experience any lack of bass with the amplifier – the presentation was very balanced. Did you get a fuller sound with the speakers before, with another amplifier, or are they new too? The amplifier ought to match the speakers for power. It's not the most powerful amplifier, but the speaker sensitivity is listed as 89dB which means that shouldn't matter. The speaker specification only gives a -6dB point for the bass response. It may be that they don't go as deep as you like? Another possible explanation is that the amp is controlling the speakers better than your previous amplifier. That would make them less boomy and could give a first impression of less bass. If it's all new and you basically like the sound, you can get more bass usually by firing speakers across the narrow part of a room and by having them back close to the wall. Also check you're not using an esoteric speaker cable – some unusual designs could cause a problem. If all else fails, there could be something wrong with the amplifier but I doubt it. Thank you for the great article and all the fantastic work you and your team is doing. On the T-Amp's anniversary, I think it's appropriate to mention that you never covered the king of the t-amps - the Winsome Labs Mouse. You will quickly appreciate why it's so special, once you understand the particular architecture. I am not affiliated or associated with the company, but I have been using the Mouse for several years now, and it's a truly exceptional product. I am certain your readers would greatly enjoy a report on it.